With the snow washed away overnight, we were dismayed to see snow covered ice still blanketing the Basingstoke canal on Sunday, when we arrived for another round of our club’s canal championship. With a clear area located, pegs were positioned and the draw taken, while the heavens opened, lashing us with ice cold rain and sleet. 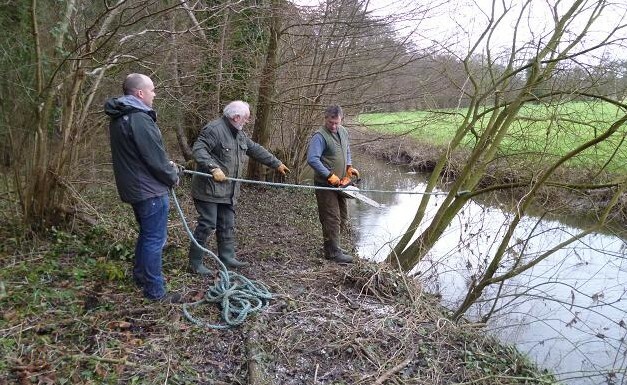 I’d left a warm bed with the promise of a dry day from the BBC forecaster and the thought of watching a float go under, so far I was not the most optimistic angler present. I got to my peg to find myself next to my main rival to my left, who now had the championship in the bag, with a string of consistent top placings, often ahead of me by one point each time. I could do with a win just to give my ego a boost. By the time the whistle blew for the start, the clouds had parted, but a gusting wind took it’s place, ruffling the canal with mini whirlwinds. With only punched bread as bait, I had no other options and after five minutes without a bite, my float bobbed and sank away as a 4oz roach took the bread pellet. Doubts now dispelled, I set about the business of catching fish, some very small, but weight to beat my rival. His net came out to land a roach twice the size of my biggest, but now I was playing a 1lb skimmer bream, this would put me well ahead. To my left, drifting towards me, was a raft of weed and twigs that was attracting the fighting fish like a magnet, extending the pole elastic as it made it’s escape bid, the tiny hook pulling free from it’s lip, as I tried to steer it away. Fifteen minutes in and I had just lost a potentially match winning fish. I threw in another ball of crumb and fished over it, lifting into a smaller skimmer, making sure to avoid the weed raft on it’s way to the landing net. I netted another decent skimmer, only to look up to see an even bigger bream slide into my rival’s net. 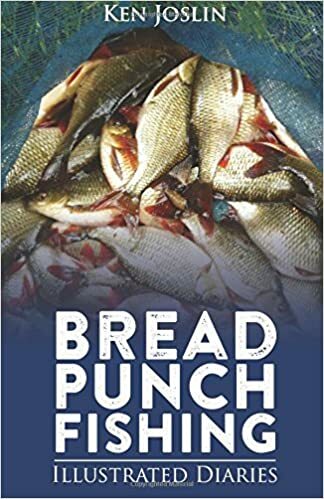 My next ball of liquidized bread produced a swirl, as a pike flashed through the shoal of feeding roach, small fish leaping clear of the water, desperate to escape. Soon after my line went solid, when the pike grabbed a roach, the 2lb jack allowing me to pull it slowly towards the surface without a fight, before turning and swimming away with it’s prize and my hook. This gave me some respite, but twenty minutes later he was back, snatching at roach as I brought them across the surface. A vicious take ripping away another of my roach. Another hook gone. I introduced another three balls in different parts of my swim, seeing the surface boil as the pike went in for the kill. I got up and walked down to the angler on my right for a chat, finding that he also had pike trouble from a much larger fish, the good news being that no bream had been taken from that end. I returned to my peg to see yet another bream slide across the surface into my rival’s net. From now on it was damage limitation from my point of view, just fishing the near shelf from now on and introducing enough feed to keep them interested. The bigger fish were down the middle, but I kept busy snatching from the margin, rather than lose more tackle to the pike. I the final whistle took me by surprise and I began packing away my gear, while I waited for the scalesman. I was top weight so far with exactly 4lb of roach and skimmer bream, with just my rival to weigh in, it could be close. When he pulled his fish from the water, I could see that he had two bream bigger than my largest and 5lb 10oz on the scales meant that he had beaten me again. This 4lb net of silver fish proves that on a very cold day, for the price of a loaf of bread, a good day’s fishing can be enjoyed with the simplest of tackle. I also tried for the pike later with a plug, but no takers. Like Arnie I’ll be back, this time armed with some dead baits. 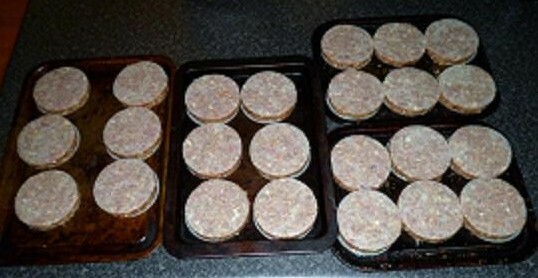 With five rabbits for the freezer, I decided to make some more bunny burgers this week. The rabbits were first jointed and all the outer membrane removed. I consider the back loins too good for burgers, filleting these from either side of the upper back and saving these for other dishes like rabbit korma, or mixing with other game for game pie. With the loins removed, five rabbits will produce three Kg of meat. Remove as many tendons, etc as possible, as they may cause clogging round the grinder cutting blade later. The remaining bones and kidneys can be boiled down with vegetables to make rabbit stock and frozen in small containers for another day. Fat has to be added to aid cooking, so I add smoked bacon lardons, or streaky bacon. In this case I also add a chorizo sausage to top up the fat content and increase the flavour. Finely chop the onion, garlic and rosemary and sweat off with the oil in a frying pan on a low heat, until the onions are softened and allow to cool. Place a large bowl beneath the meat grinder/mincer outlet. I prefer the coarse cutting plate setting, although the medium works fine. Once the grinding process is under way, I try to add the meat, lardons and pieces of sausage as I go, to mix the contents and flavours. With a modern electric grinder this will not take long. I used a manual grinder for years, which was in keeping with the rustic way of life, but very hard work. 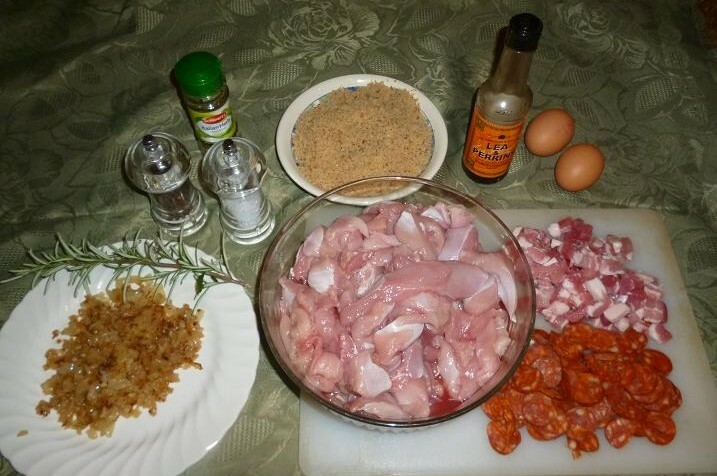 With the meat ground, I sprinkle the tablespoon of Worcester Sauce over the top and stir in the onion mix, before covering with the bread crumbs, sprinkled with the two tablespoons of mixed herbs. I stir this again before adding the beaten eggs and mixing thoroughly, cement mixing principles coming in handy here. The final operation is to make up the burgers. 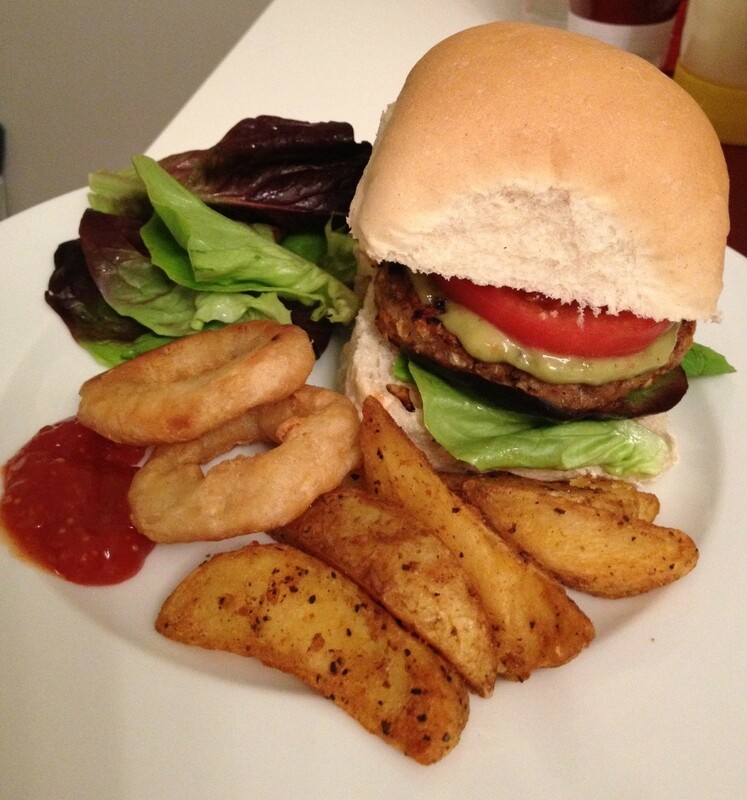 I have a burger press, which produces a consistent quarter pounder, with a grease proof disc top and bottom. For the rustic look, roll into a ball in your hands and pat down into a pattie. This is just one recipe, the same basics apply, but you may wish to add a few chopped tomatoes to the grinder, or pickle, chutney, or a mix. Likewise instead of the Worcester sauce, add BBQ, or sweet chilli, or the lot. Just remember keep it simple, it’s only a burger. The proof is in the eating. Very tasty. 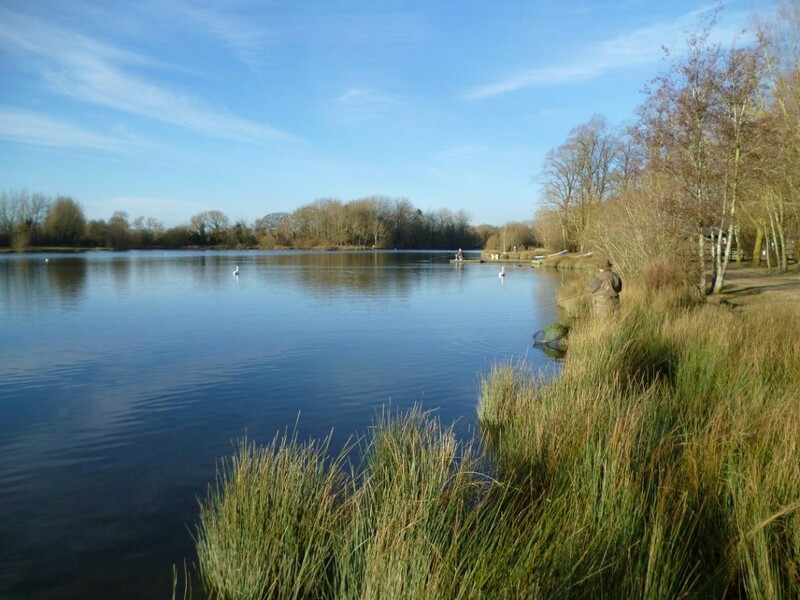 My phone rang with an offer I could not refuse, a visit to Bushey Leaze trout fishery, picked up and dropped off at my door, a mild, dry day forecast and the chance of big rainbows from this spring fed lake at Lechlade. The previous week my companion Pete had taken twelve fish between three and five pounds fishing an orange “Blob”, static under an indicator, so a quick look on Google produced an image, which to my eye said pellet fly, no doubt the only food these fish had ever seen. A hunt through my fly tying materials came up with some hot orange marabou for a tail and orange chenille for the body, tied over a built up body to give bulk, on a short size 14 hook, producing three in quick time. Having cut my teeth on the Concrete Bowls, fresh water reservoirs around London in the 70’s, where all fish were introduce by Thames Water at 12 inches long and left to grow on in their vast acreages, which often reached depths of ninety feet, I have always felt prejudiced against the smaller commercial fisheries, where the paying public have demanded larger fish and comfortable fishing. In the 70’s, the strain of rainbows were fertile fish, which went into spawning condition early in the year and would often be black and kiped up in April, when the trout season began. In those days the reservoir fishing was subsidized by the nationalised water companies, but when they were privatized in the 80’s, support was withdrawn, leaving the door open for commercial operations, who with the need for year round fishing, stocked infertile triploid rainbows with rapid growth rates. With a freezer full of various game and trout from my last outing, the last thing I needed was more trout, so had decided for a £30 three fish limit, but with Pete’s offer to smoke my fish, I paid the extra £7.50 for six fish. Arriving at the water’s edge, conditions seemed perfect with just a light breeze causing a slight ripple on the crystal clear lake, where fish could be seen moving and a few rods were already bent into fish. Pete walked down to his favourite bay, while I opted for a spot between trees, where I’d seen a fish top. With my indicator two feet above my new “Blob” I cast in, only for my purple indicator to be taken seconds after it hit the water. Rediculace. This did not result in a fish, the following casts producing swirls at the indicator, or it’s brief disappearance as my Blob was mouthed by more than one rainbow. I could have slid the indicator down to the hook and fished with that, but I did want to feel that I was at least using some skill, so took it off and began a very slow retrieve, getting plucks and on, off strikes. After ten minutes a fish held on long enough for me to set the hook and soon felt the juddering fight of a decent fish, which after some tail flapping, gave up and came to the net. About 3lb, it was a typical stew pond fish, front fins missing and a chewed tail, it’s brief chance of freedom ending on a muddy bank. Another cast and another fish on, this one putting on a better show, making several rapid runs followed by body shaking leaps, before the runs got shorter and the head shaking began. Convinced the hook was about to drop out, I entered the shallows and got a boot full of freezing water, as I reach over to net the still struggling rainbow. Slightly larger, this one had a full set of fins, although it’s tail was split in places and it’s nose and chin were flattened off, another scruffy fish. Fifteen minutes in and I already had two fish, do I continue fish mongering this shoal of confused rainbows and pack up in an hour, or shall I try else where? I chose the latter and went off to find Pete, passing another angler scurrying to claim my fish filled spot. By now the sun had come over the trees and the wind dropped, the only ripples being made by the ducks and swans. I found Pete studying his motionless bite indicator. This was where he had a dozen fish last week, but today he hadn’t had a take and was now on his fall back method, the bloodworm without a touch. I continued round and could see that few anglers had caught, one complaining that he’d worked hard for one fish today, but had caught eight in an hour the previous week. Finding another tree lined bay, I searched out the water in front of me, increasing the lengths of my casts, fishing depths and speed of retrieve, observing the lack of action from the boat anglers and feeling that I should have stayed longer in my first spot. Following a long cast and a thirty second count down, my line tightened as I began to retrieve, the line spraying up water, when I raised the rod to set the hook. This was a very good fish, beating the surface with it’s tail, then diving deep taking line in an arcing run. The fight went on for five minutes before the first sighting showed a good conditioned 5lb rainbow, another five minutes seeming to pass before he was ready for the net, only to turn and slip the hook in the final seconds. I slapped the rod against the water in frustration. The size 14 barbless hook had dropped out on the bank of the previous two fish and the fight had loosened it’s hold at the critical moment. Walking back Pete was still fishless, so we decided it was time for a sandwich in the sun at the fishing hut, giving me the chance to empty the water from my squelching boot, while deciding what to do next. We could see that the aquarium was now vacant and fish were still moving there, so Pete made his way to the spot and had soon broken his duck, following up with another, to equal my catch. With the sun passing behind the trees, we packed away the rods, after a hard day, bright sun and a flat calm giving us a beating. 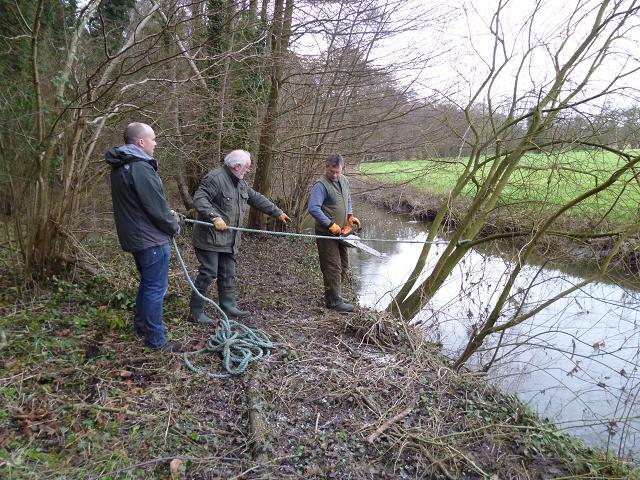 The floods abated this week, which allowed a small band of volunteers to tackle an overgrown section on our little trout stream, where several trees needed pollarding and another had fallen across the river. Eight from a membership of thirty was a healthy turnout on a January morning, there being plenty of chat about flies and who caught what from where. Interestingly, some favourite sections for some, had proved fishless for others. Six hours hard graft certainly blew away the Christmas cobwebs, but several good gaps had been created in the dense undergrowth to allow in the sunlight and allow casting, while still leaving plenty of cover for feeding trout. With no rain for a few days and warm 10C temperature, I was hoping to find a few rabbits out and about on my permission at an 80 acre equestrian centre this afternoon. I’d only walked a few hundred yards to my first rabbit hot spot to realise that a change of plan was needed. A corner, where a bramble covered ditch runs along the side of a copse, was under six inches of water, the ditch resembling a canal. I usually expect to see several rabbits around this area, where had they gone? Not drowned? Continuing through the copse, I saw signs of fresh burrowing, so all was not lost. As I made my slow progress through the copse, I saw several Canada Geese in the field to my right, but these are off limits, as were the pheasants trotting ahead of me along the path, the leaseholder trying to keep the centre as a nature reserve, it being bordered by housing estates on three sides. The copse was once parkland, part of a stately home, and had been planted up with a wide range of plants, now left untended, but in their season they add to the pleasure of having access to this private area, carpets of snow drops, giving way to daffodils and blue bells, while the scent of honeysuckles fill the summer air. When I first visited, rabbits were in their hundreds, undermining trees, burrowing through paths and ruining the grassland, making it unsafe to walk, let alone ride a horse. Today there were none to be seen, so I made my way to the base of a tall pine, which gives cover from above, while providing a clear view of an equally tall oak ten yards away, both trees providing ideal roosts for my next quarry the wood pigeon. 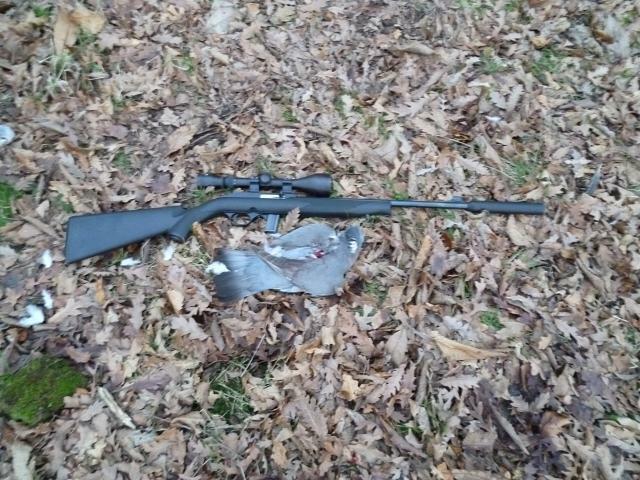 For pigeons I prefer to use my Career 707 PCP air rifle firing 21 grain Bisley Magnum pellets, as the pellets lose their momentum quickly and shots can be taken at targets low down in the trees, but equipped for rabbits today, I had my Magtech .22 semi auto rimfire. This means overhead shots only, as a 45 degree shot puts the houses half a mile away within range of the 40 grain bullet. Once in position, it wasn’t long before a dozen pigeons glided over to take up their roosts, an ideal shot for a 12 bore, but for me with a rifle they have to perch first. They landed behind me, causing me to twist my body for a shot, only to hit the branch below my chosen bird. Off they clattered. I moved round the tree to shoot from the other side, before ten minutes later they returned, this time a clear shot supported by the tree trunk, had a fat pigeon spinning out of the branches fifty feet above. With the birds flown, I retrieved the pigeon and cut away the dark breast meat in time for the next flight. Cross hairs on, squeeze the trigger and another hit the ground. Ten minutes later another fat woodie was at my feet, it’s crop full of ivy peas and mistletoe berries. With the light going fast and a good walk ahead, back to the van, I called it a day with six tasty breast fillets in my bag.